This year has been crazy, now I am no Scrooge. But Christmas is AFTER Thanksgiving. Most years I have no desire to hear anything Christmas related till after turkey day. There is no need to mix the two, or gip the turkey out of their ONLY holiday. This year, however, I am all in the holiday sprit now. I am so ready for cozy sweaters, scarves, mittens, hot chocolate. The jingling of bells everywhere we go. Peppermint in the air. 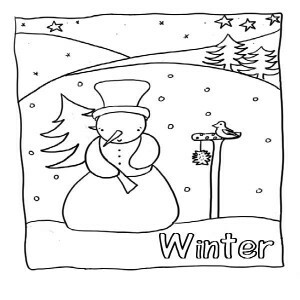 There is something magical about winter and I am ready for it now. How about you all? Are you looking for something to get into the holiday spirit? 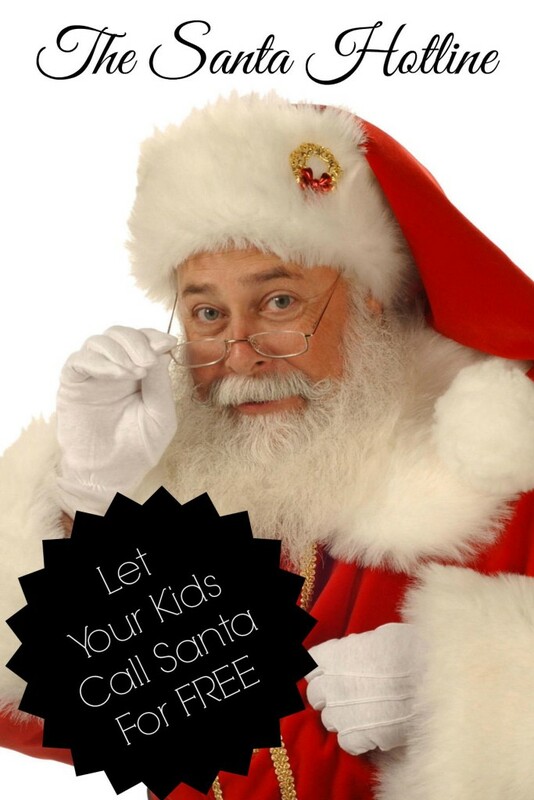 Are your kids working on their Christmas lists for Santa. You know that there is only a few weeks left to get that list into the big guy in red. So instead of writing him, hoping that not only he gets it in time, but that he has not completed the gifts; give him a call instead. Thats right, you can call into Santa. Even better, you can do it for FREE!! 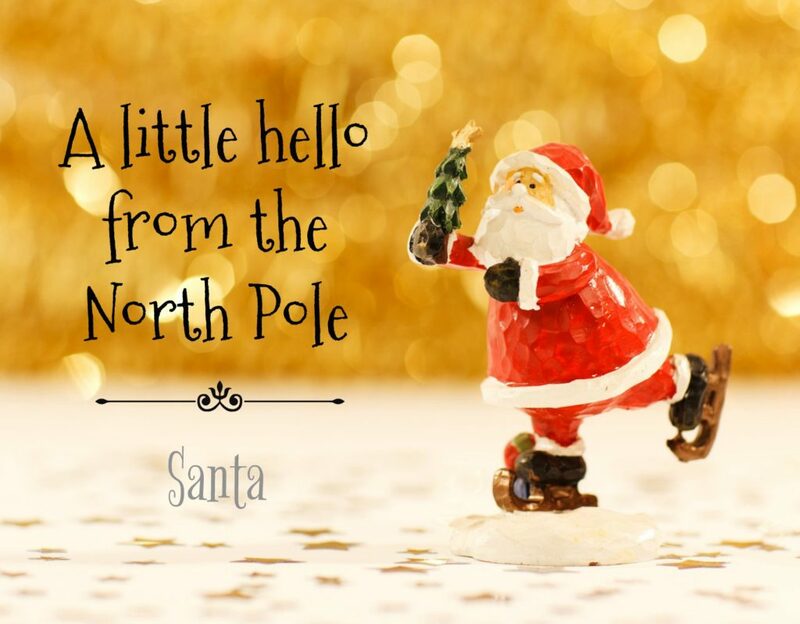 Now, Santa is super busy this time of year, so he probably isn’t answering his phone (except for when Mrs Claus calls), but you can leave a message and he does listen to every single message he gets. How fun is that? My girls have called into him and LOVED it. It was so cute, and sounds just like what his answering machine would say. His little message about all the good boys and girls is adorable. There is even a shout of to his reindeer, and of coarse Mrs. Claus don’t want to leave her out. Click here for the phone numbers. Give him a call and let me know what your kids thought? Did they think it was as fun as my girls did? I am so excited to be guest posting over at The Real Thing With The Coake Family. If you are not following KC yet, then you need to. 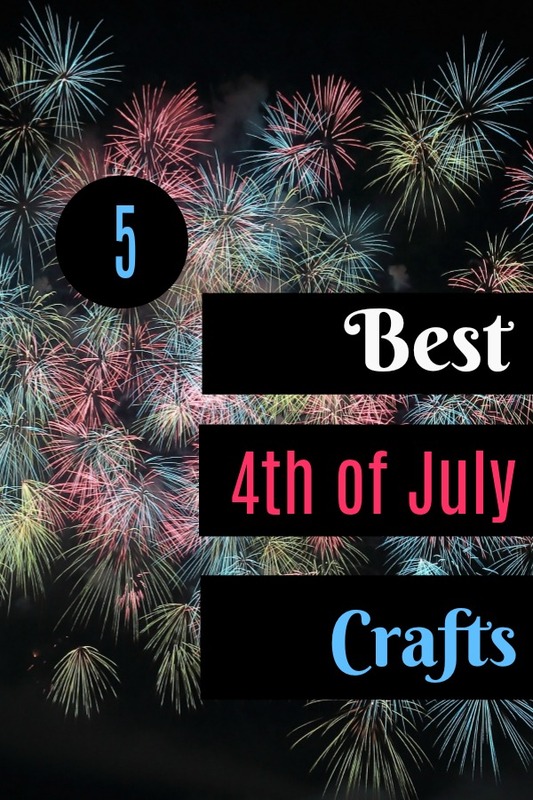 She posts about all kinds of DIY things, from American Girl accessories, to interior design, to crafts, to holiday decorations, basically you name it and she posts about it. Not only does she do amazing projects, she words them in ways that even the most uncrafty of us (aka me here) can follow and make great things. Click here for her blog. She is doing this great weekly Summer Of Fun party, featuring different bloggers. And I am getting to kick it off!!! Well, without further adieu, lets get this Summer Fun rocking and rolling. I thought that we would start the party with something that everyone loves: CHALK. Kids love it, adults have fond memories of playing with it, and lets be honest it just screams summer. Plus it is so simple (not to mention cheap), all you need is a piece of chalk. BUT…… to see what they are you are going to have bounce over to my lovely friends blog. Click here. 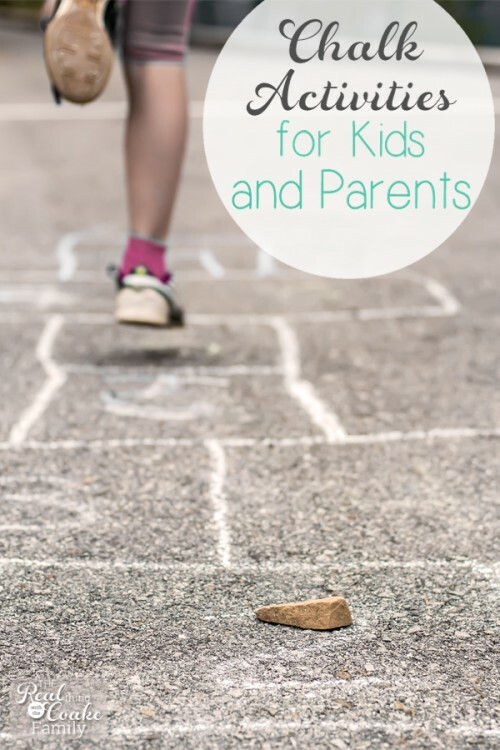 First I want to say a big Thank You to Kat from Confessions of the Perfect Mom for giving me an opportunity to guest post on her beautiful blog. One of the things that I have loved most about starting my own blog is “meeting” such an amazing community of bloggers. Thank you Kat. Working with you has been such a pleasure. If anyone would like to come and visit my blog, Just Only Home, you are more than welcome to stop by. Let me know that you found me on Confessions of the Perfect Mom! This season leading up to Thanksgiving is one of my favorites. If there is anything I’d like to be, it is thankful, and I love the idea of expressing our gratitude in a way that is visual and beautiful. Something that the children can wake to in the morning and add to before bed each night. We made our first Thankful Tree this year, and I think it turned out well. I hope that each year it will be a family tradition. The idea is for each person in the house to write one thing they are thankful for on a leaf each day until Thanksgiving weekend. 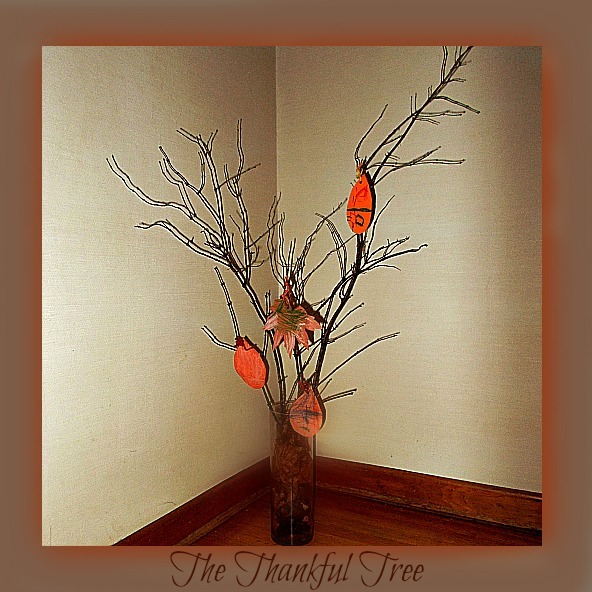 We were inspired by Life’s Hidden Treasures and her idea for a Thankful Tree. We weren’t sure how we wanted to go about it, though. 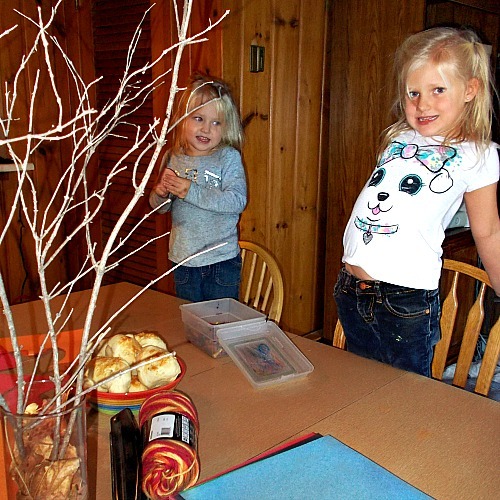 We pondered making a paper version for the wall, or finding branches outside and setting them in a base. We decided our tree needed wooden branches so we tromped around the yard a bit finding some branches that came down in our last mini blizzard. We just needed a few small branches to fit in my tall vase. Then we filled in with small pebbles to add weight. 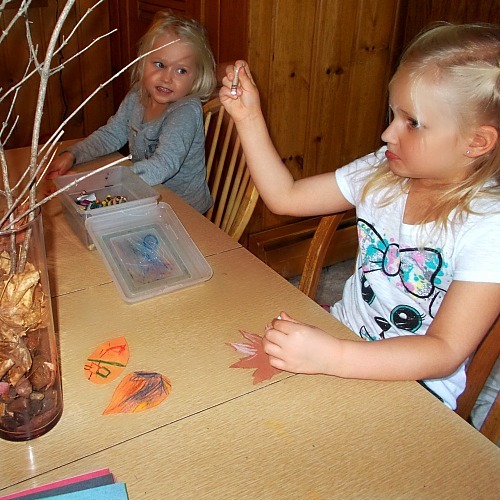 My teen gals helped me cut out all different colors of fall leaves and the little ones helped to color in the side of the leaves we will not be writing on. It was my favorite part of the whole evening and we accompanied it with Glazed Honey Rolls and Pumpkin Butter. I love the moments I can spend with them creating memories and this was what I wrote about on my own personal first thankful leaf. 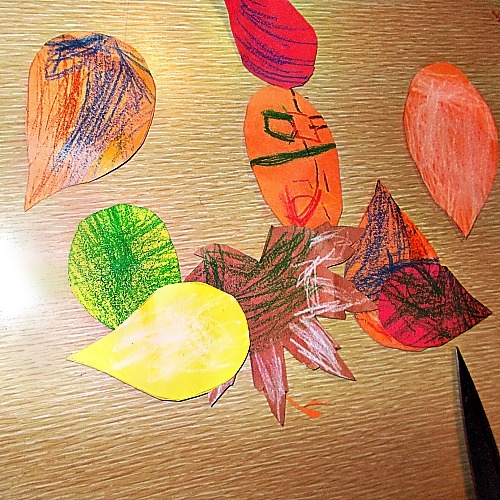 We then cut some pieces of string to tie on and used a hole punch on the leaves. Now they are ready to go each night when it is time to add our daily gratitude. I think our Thanksgiving tree is perfect. What is February 2? 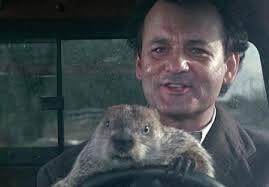 Groundhog Day!! Well then, what exactly is Groundhog Day? What a great question. Groundhog day is celebrated in Canada and here in the United States. We sit and watch to see if when Phil the groundhog will see his shadow when he comes out of his burrow. Our tradition states that if he doesn’t see his shadow, he will come out of his burrow and this will start spring. However, if he does see his see his shadow and go back into his borrow, then we will have 6 more weeks of winter. 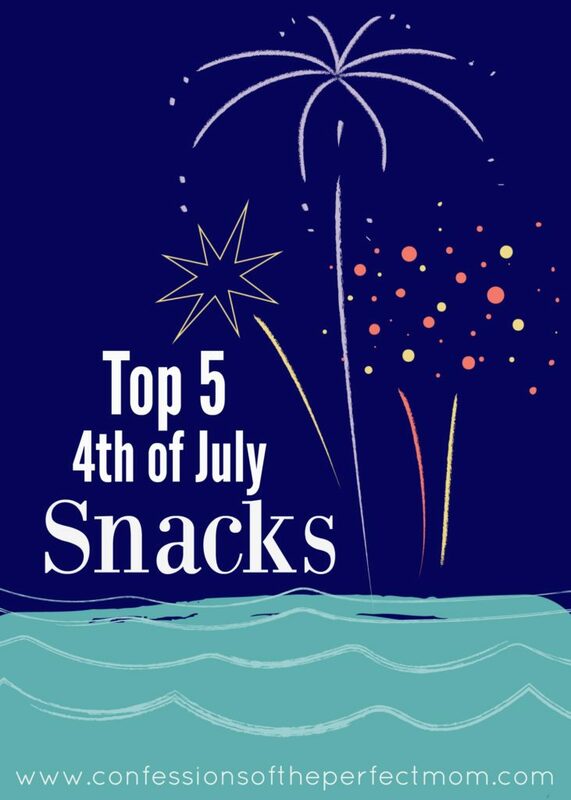 To help you celebrate this yearly tradition. 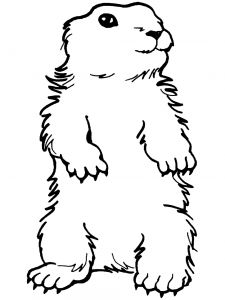 I have attached some fun coloring sheets- groundhog, spring (if he comes out) and winter (if he goes back in). (and a penguin because penguins are cute) Are you hoping that he comes out to start spring and end our arctic winter. Or for a few parts in our country are we hoping that he goes back into his burrow so hopefully we can have a bit of a winter? Either way, have a great Groundhog Day! PS- Monday will be here before you know it. What does that mean? It is our weekly Monday Morning MakeUp Madness Linky Party!! Be sure to stop by and see what everyone has been up to, and link up something that you have done. Anything beauty related (nails, makeup, hair, skincare, fashion) is what this party will be dedicated to. All you have to do is come here, and click on the blue button to link up. So easy, see some really great blogs and get a few new bloggers to see yours. I am so looking forward to seeing you all there. New Year’s Eve with the kids…. Family fun?? Lets make this holiday at home, as fun as going out. This is the first year that we will be at our house, with the kids for New Year’s Eve. I was on a mission to make it enjoyable and memorable for not only all three girls, but for us adults too. How is that possible? 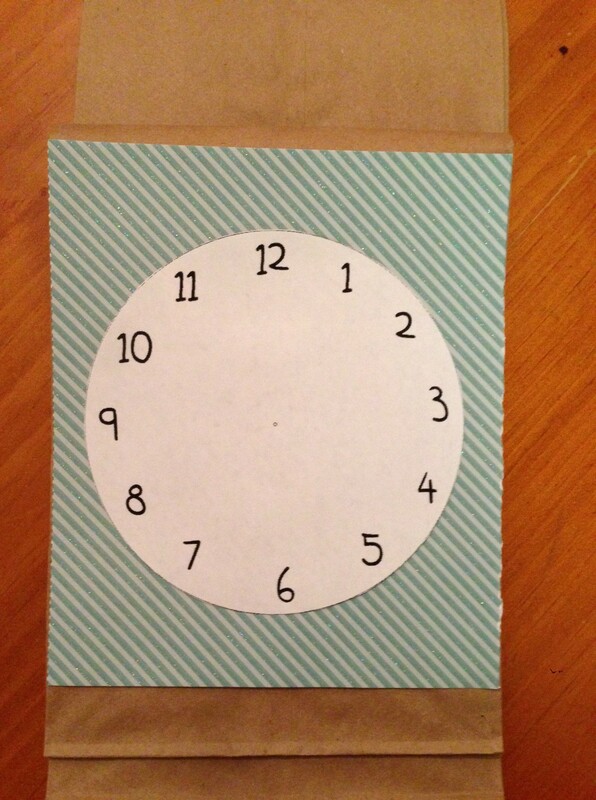 Well, this little craft will give the kids something to look forward to at each hour mark, and kept them busy so the adults can enjoy some down time. 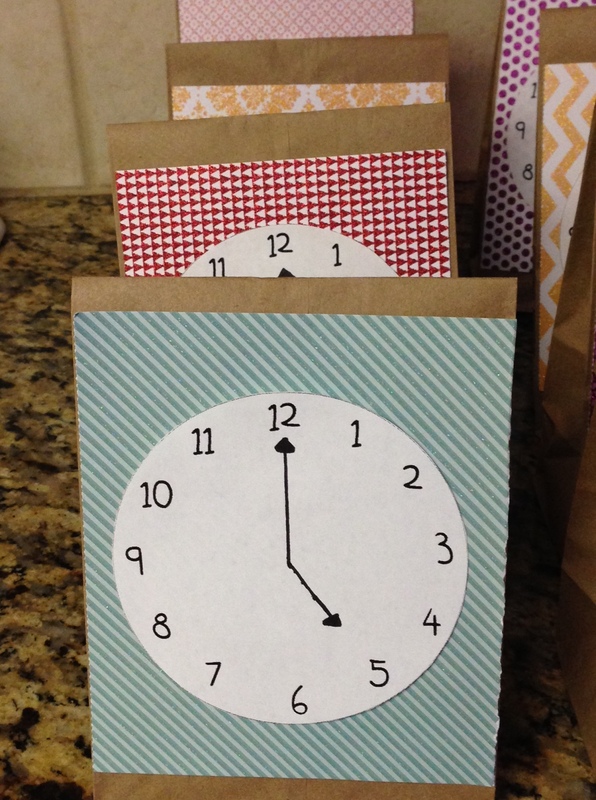 Each hour the girls will open one of the bags; it will have some candy (or other treat) and a card with an activity that we will be doing for that hour. Things like: game time, watch a movie, make desserts and so on. It is super quick to put together, seriously took me an hour, and you will have all the needed materials already. How great is that? 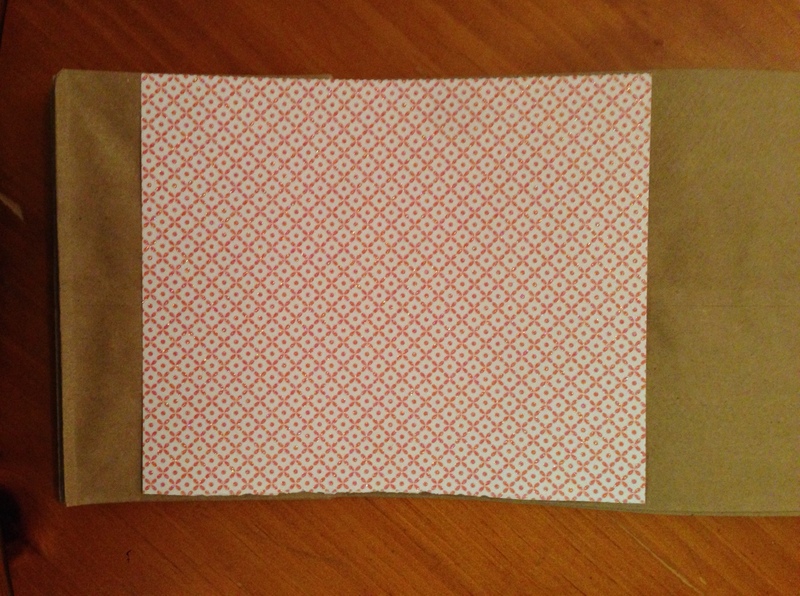 Attach a piece of the card stock to the front of a paper bag. I used tape, but you can use glue if you prefer. 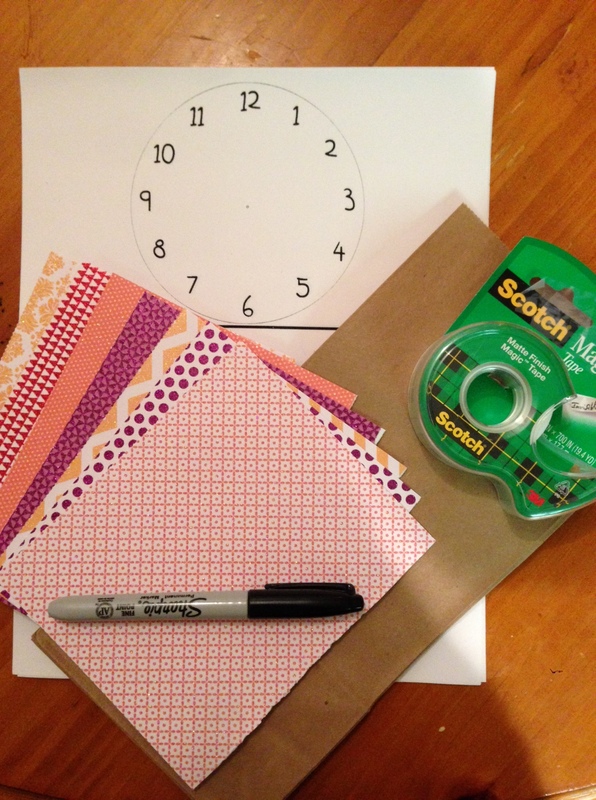 Attach one of the blank clock templates to the middle of the card stock. 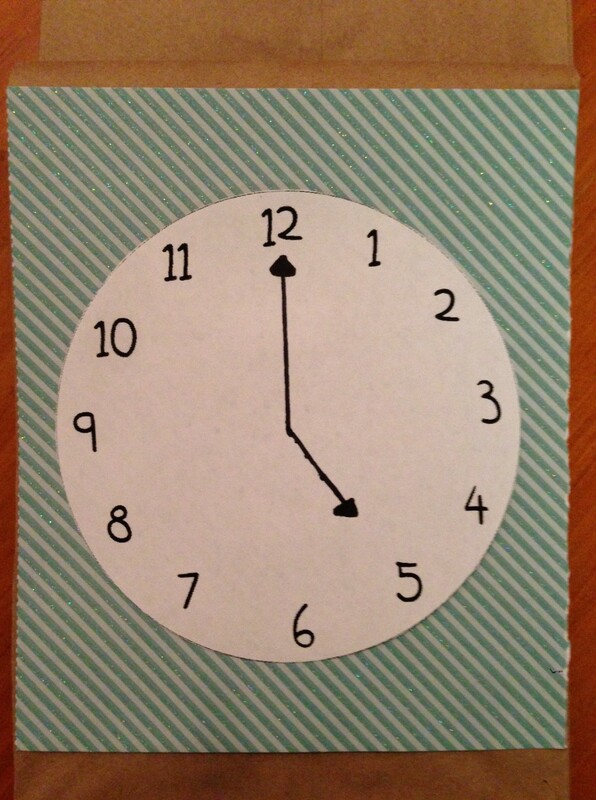 Draw the hands of the clock on the clock face. All that is left is to fill the bag with whatever you want, and leave a little note as to the activity that will be going on. 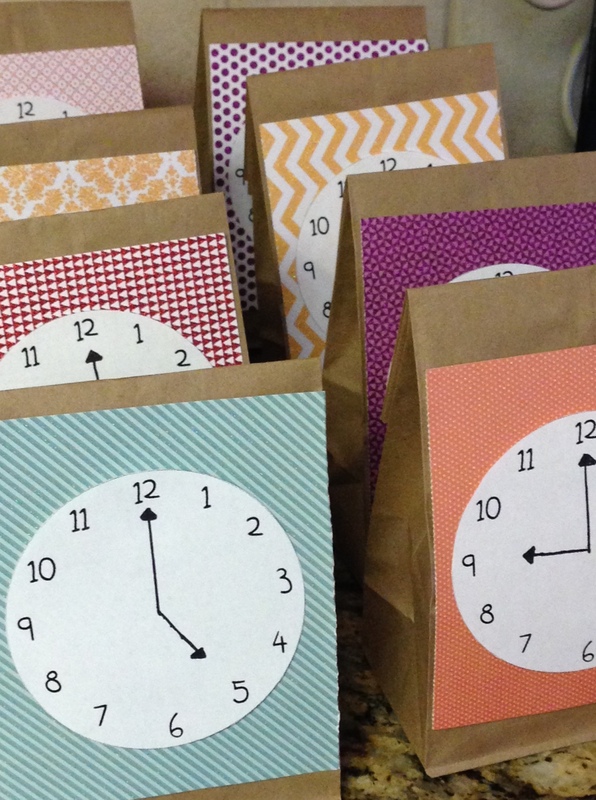 Your little ones will be so excited to see these set out and the anticipation of getting to open each one will keep them excited about the night. 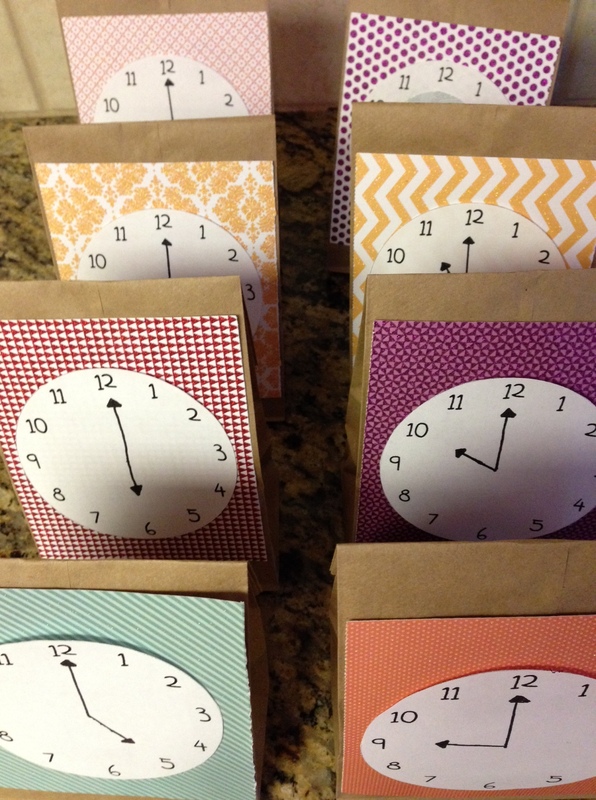 Let me know how it turns out for you or what goodies you choose to put in each bag. Gotta love Christmas! Even the most grinchly person, can get into Christmas lights. This year instead of driving around, stuck in the car trying to find neighborhoods that have nice displays up. We opted to go downtown, to the city court house. Which ALWAYS goes all out for Christmas. Baby, got so into it. She just thought that all the lights were the best thing ever. They were such good sports and never complained about the cold. (It was about 34 with a slight breeze). Tink was happy to break out all the winter accessories. She has been dying to wear all the hats, scarves, and mittens again. Belle was all about being able to jump in the leaves and kick the small piles of snow that were left laying around. Lets be honest, the best part of the night is coming home and baking the cookies. I am a total cheat when it comes to the baking of the cookies. There is no home-made, grandma secret recipe action going on over here… BUT I do make my own icing. And even with the cheater cookies, Tink and Belle had a blast frosting and decorating them.